Minnesota racked up 26 hits in a doubleheader sweep that stopped Missouri State’s 10-game win streak Saturday at Hammons Field. The Golden Gophers pulled away late for 12-5 win in the opener, before building a five-run lead and holding off MSU’s late charge for a 7-5 victory in the nightcap. The Gophers (12-9) recorded at least one hit in 15 of 18 innings during the twin bill to give MSU (19-4) its first series loss since March 13-15, 2015 at Kansas State, as well as the Bears’ first home series setback since April 2014. Minnesota pounded out 15 hits – a Bears opponent season high – in halting MSU’s win streak with a 12-5 victory in the opener. Terrin Vavra turned in a four-hit game to help the Golden Gophers score seven times in the seventh and eighth innings to break the contest wide open. The Gophers built an early five-run advantage and recorded at least one hit in all nine innings to even the series at one game apiece. Micah Coffey started U of M’s two-run rally in the second with a leadoff double, as a Jordan Smith RBI single put the visitors on the board, before a passed ball allowed a second run to cross the plate. MSU starter Dylan Coleman ran into some control issues in the top of the fourth, handing out three consecutive bases on balls to help fuel another Minnesota rally. A Dan Motl sacrifice fly and a run-scoring single by Vavra added to the Gophers’ run total, and another defensive miscue for MSU brought home a third run in the inning for a 5-0 Minnesota lead. The Bears chipped away at the deficit with a two-run rally of their own in the home half of the fourth. Doubles by Hunter Steinmetz and Jake Burger put MSU on the board, and a sac fly to center from Spencer Johnson made it a three-run game. MSU tacked on a run in the fifth after Jeremy Eierman led things off with a double to left, as Burger recorded the second of his three RBIs in the game with a sacrifice fly. But Minnesota’s offense erupted for five runs in the seventh, using another MSU error and back-to-back singles by Coffey and Connor Schaefbauer to ignite the rally. Riley Smith provided the punctuation mark, belting a pinch-hit grand slam onto the left-field berm to hike the Gopher lead to 10-3. A solo shot by Austin Athmann and a two-out, RBI single by Matt Stemper in the eighth stretched the margin to nine runs. The Bears plated a pair in the ninth on run-scoring hits by Burger and Blake Graham, but finished the game with just six hits for their second-lowest single-game total of the season. Coleman (3-1) suffered his first loss as a Bear after allowing five runs (three earned) on five hits, while striking out five over 3.1 innings. Dalton Sawyer (3-2) earned the win for Minnesota, striking out nine while allowing three runs on four hits over his 5.2 innings of work. Game two featured more early offense from the Gophers, who scored two runs in the first after a one-out error and a two-out walk gave the visitors new life. Coffey then delivered another clutch blow with a bloop two-run double that narrowly eluded a diving Eierman in shallow left field. 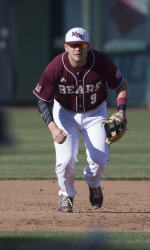 The Bears responded with run in the home half of the inning after Steinmetz drew a leadoff walk, swiped second for his 10th steal of the season and scored on Justin Paulsen’s two-out single to left. Two innings later, the Gophers reeled off five consecutive hits after MSU starter Andy Cheray retired the first two batters of the inning. Once again, Coffey played a central role, starting the string with a base hit up the middle, before Troy Traxler singled and Schaefbauer doubled home a run. Stemper followed with an infield hit behind the bag at third to bring in Traxler, and Jordan Smith’s gap shot to right-center chased home two more to make it a 6-1 game. MSU scored a single run in the third, using a two-out walk to Johnson and back-to-back hits by Burger and Paulsen to slice the deficit to four runs. But U of M starter Toby Anderson limited the damage, stranding runners on the corners with a strikeout of Graham to end the inning. A two-out, two-run single by Meyer in the fifth further dented the Gopher margin, but Anderson once again worked his way out of a potential big inning, getting the inning-ending fly ball to center off the bat of Alex Jefferson to keep it a 6-4 contest. The Bears threatened to even the score in the ninth, using a two-out, RBI double by Burger to close the gap to 7-5. Paulsen then drew a walk to bring the potential go-ahead run to the plate, but Gophers closer Jordan Jess struck out Graham to clinch the sweep and the series for Minnesota. After going 2-for-4 in the opening game, Burger once again paced the MSU offense in game two, finishing 3-for-5 with an RBI. Additionally, both Steinmetz and Aaron Meyer extended their respective hit streaks to 15 games with safeties in both contests. Coffey led the way for the Gophers, going 4-for-8 with three RBIs in the two-game sweep, while Shaefbauer recorded five hits on the day. Up next, the Bears hit the road for a Tuesday (March 29) non-conference contest with Kansas. Game time is set for 6 p.m. at Hoglund Ballpark in Lawrence.